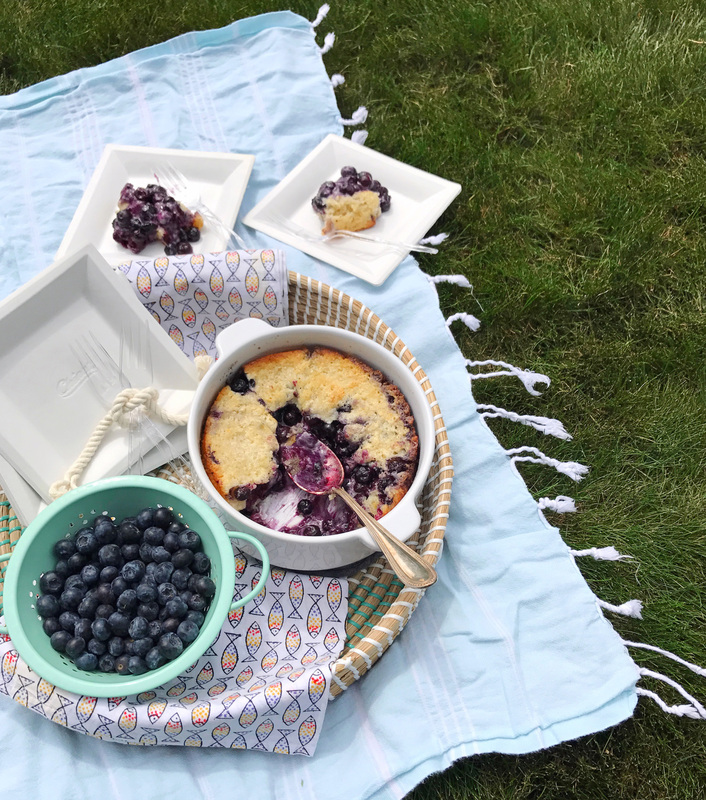 We have a few summer traditions that are absolute essentials in our family, and one is particularly tasty: making my grandma Ida’s homemade blueberry cobbler recipe. It’s simple and fairly quick to make. We’ve done it so many times I can almost assemble it blindfolded. 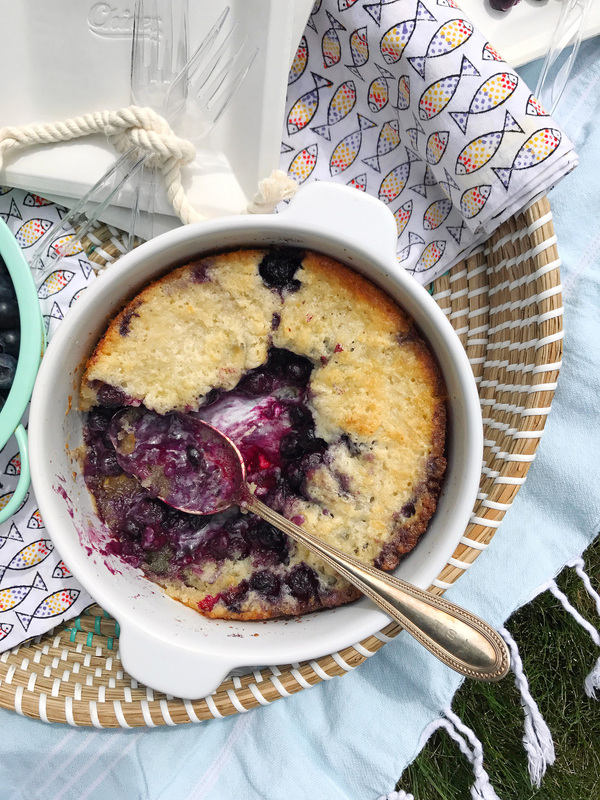 Most importantly, each bite tastes like a burst of summer memories; the warm blueberries scooped out onto a plate with vanilla bean ice cream melting over the top. 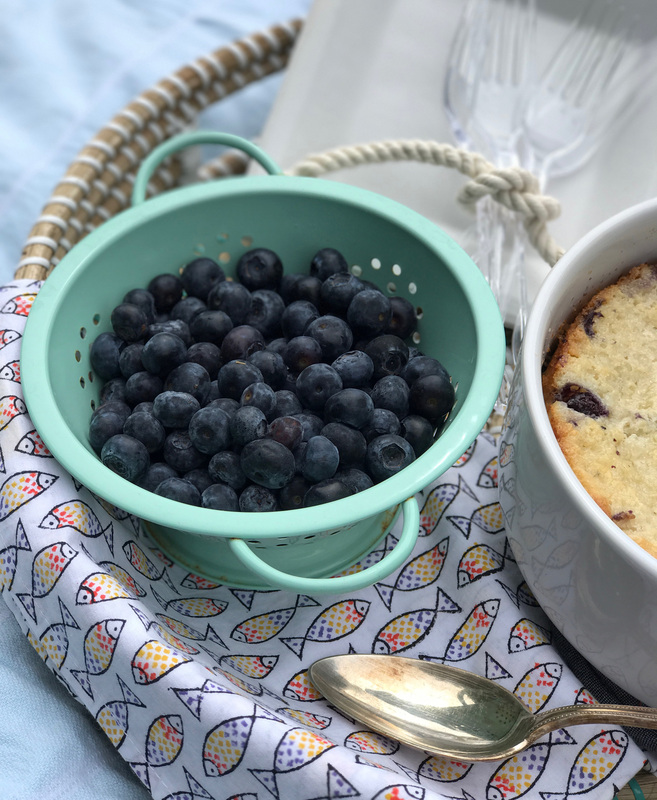 We had family visiting recently, and with the plethora of blueberries available this time of year it was the perfect time to pull out the weathered recipe card. It’s always such a hit, in fact, as I was taking these pictures, my sister’s boyfriend was hovering nearby wanting to know when he could snag a plate to dig-in. I think the simplicity of this recipe is what makes it such a summery dish. It’s a no fuss dessert that can be whipped up after a beach day, and served outside with paper plates in the grass with lots of bare feet and ice cream. When I made this batch we threw down some blankets in the yard after dinner for a cobbler picnic. 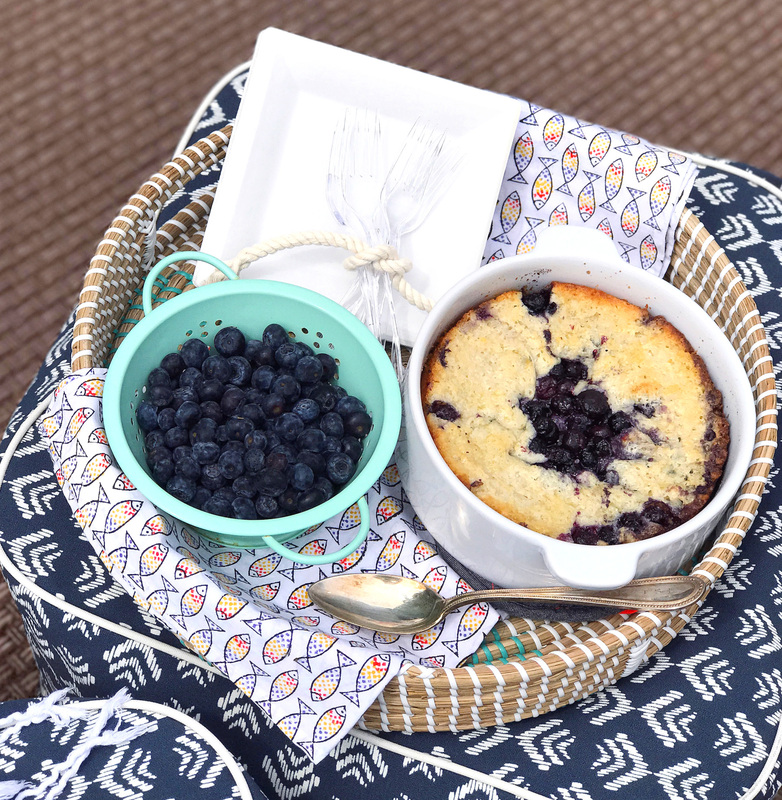 I filled up a big rattan tray with the cobbler and a few extra fresh blueberries. Chinet® Cut Crystal® cutlery and Chinet® Classic White™ square dessert plates were tucked in for easy clean up after we ate. I dressed up these pieces by tying all of the forks up with a piece of fun nautical rope. Nesting everything in one big tray makes for easy transport, and gives you a mini surface for serving when you’re picnicking. Carrying a rattan tray kind of makes you feel like you’re Ina Garten—right? 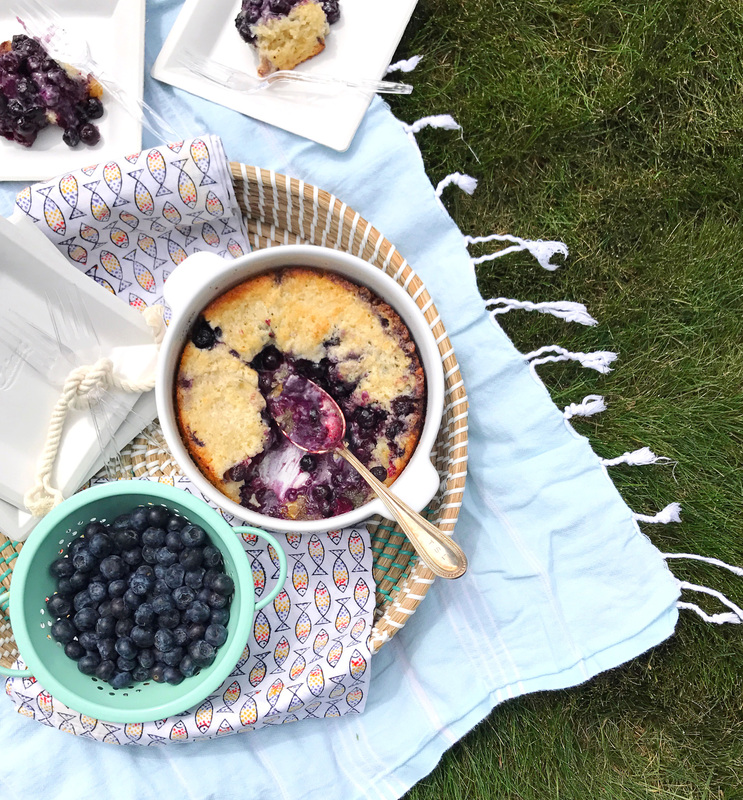 Get the full blueberry cobbler recipe below, and get your picnic on. Fall will be here before you know it! Melt butter in a deep round casserole dish while the oven heats up. In a bowl, sift together flour and baking powder; combine with 1 cup of the sugar and milk. Set batter aside. In a small saucepan, combine remaining ½ cup of sugar, blueberries and lemon juice; simmer on stove for 7-10 minutes. Pour batter over the melted butter, and then pour blueberry mixture over batter (do not stir). Bake for 45 minutes at 350 degrees or until golden brown. Please note: This post was created in collaboration with the Chinet® brand. All opinions, ideas, and content are my own. Thank you for supporting brands that support this site. Baby Foodie – Starting on Solids and Making Homemade Baby Food. Nautical Party Supplies.